Already have your Paul George Los Angeles Lakers jersey on custom order? Well, not so fast. It’s apparently looking more and more like he could stick with the Oklahoma City Thunder. 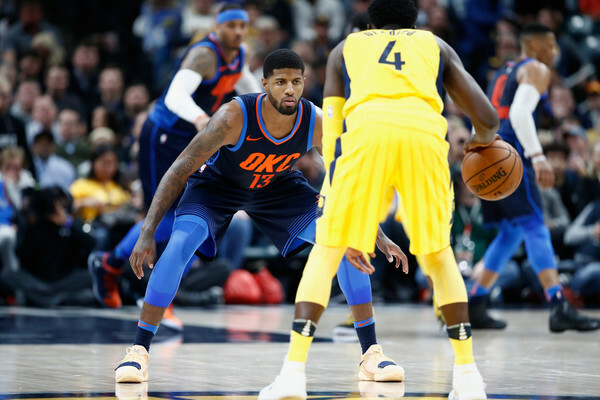 There is a growing belief around the league that Oklahoma City has a far better chance to retain the free agent-to-be Paul George than many believed when the Thunder crashed out of the first round of the playoffs. As George prepares to field the Lakers’ long-anticipated interest, his willingness to post an Instagram picture of himself last month from a hospital bed after undergoing arthroscopic surgery on his left knee has helped to fuel the notion in some corners that he’s in no rush to leave OKC. This will come as no surprise to anyone who isn’t a Lakers fan. The Thunder can offer George, who holds a player option for 2018-19, a fifth year that no other team can dangle. Extra financial security has to mean something to him; it means something to everyone. Joining the Lakers is also akin, probably, to punting on a year or two of his prime. Even if he heads to Hollywood with LeBron James, the Purple and Gold won’t have the depth or star power to beat the Golden State Warriors. They probably don’t even get past the Houston Rockets. None of which is to say the Thunder are much better. Their Carmelo Anthony dilemma and luxury-tax situation looms large. But there’s a clearer path for them, with a healthy Andre Roberson, to party-crashing the Western Conference’s upper crust. Things, of course, could always change. Going to the Lakers with LeBron, should he actually be interested, will no doubt be tempting. Los Angeles could also have trades in place to acquire a third star in the event both come. The point, though, isn’t to guarantee George’s return to Oklahoma City. It’s to acknowledge that the Thunder have a chance.